Sometimes, even before I get a product, I simply know it is going to be an amazing fit. Heritage History was one of those products. My review items were not even in my house for 24 hours when I knew I needed to purchase more. So what is Heritage History? 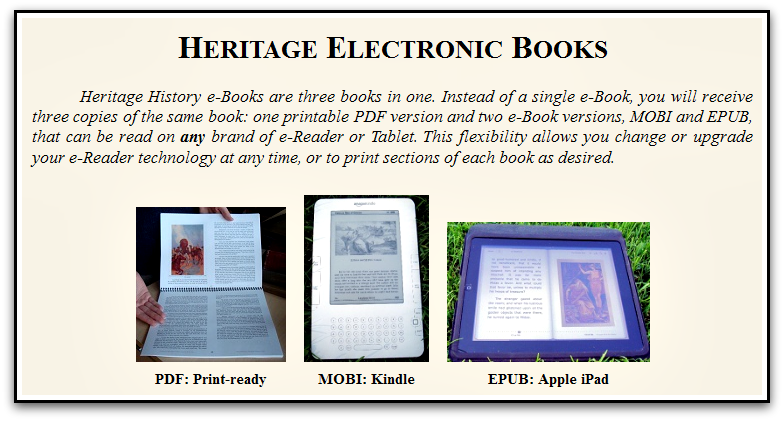 First, it is a CD-ROM filled with all sorts of great living e-books from a particular historical period. The e-books are in three formats -- pdf (which I used on my computer in making decisions about what to use, and this would be the best format for printing), mobi (which I put on my Kindle), and ePub (which I put on the Nook for my kids to use). The book's titles are color-coded on the website, in the various documents, and on the back of the CD case so you know which are better for the younger set, the middle-school group, and for high schoolers. And of course, they all relate to a specific time period. In this case, the British Middle Ages. 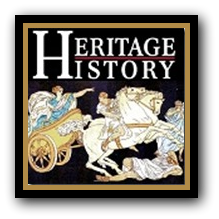 This part of the History Curriculum products is also present on the Heritage Classical Libraries titles. I own the Early America Library, which hits on history from colonization up through WWI. I love this volume. There are three other Classical Library titles: Spanish Empire, Christian Europe, and Modern Europe. I want to own them all. At $19.99 each, that will happen eventually. The Classical Curriculum CDs are so much more though. First off, there is the Study Guide. Oh, wow. Simply amazing. This study guide breaks down the entire historical time period into "eras" that make sense. Within the eras, the guide gives an overview, talks about key dates and key figures, and specifies the books from the collection (or the chapters within the comprehensive ebooks) that relate to that time period. You (or your child) decide which books to read, how much to read, or whatever. You can also pursue your child's interests if you wish by looking for more resources elsewhere. There is enough structure to make me feel secure in what we are doing. There is enough flexibility that I don't feel guilty for focusing on archaeological resources we have in our home already. The Study Guides are also available in a printed version, ready to put into a three-ring binder. The printing is great, and the full-color artwork is appealing. However, I prefer to pull up a pdf guide on the computer and just print the occasional page, so these are not something I would purchase. I know I'm weird like that though. Everyone I know would rather have a physical copy! At the risk of sounding like a bad 80s infomercial... oh, why not? "But wait! There's more!" There is a pdf file that that includes geography terms and maps. My boys are particularly impressed with a timeline of the wars/battles in Britain from 55 BC through 1718. Also included are fabulous maps, some reading logs and book registers, and two user guides. Well, I've spent money at Heritage History. That pretty much sums it up, doesn't it? Here is what I love. I can sit down with one $24.99 CD-ROM, and I can glance at some color-coded book titles and have all my kids covering roughly the same stuff at the same time, yet each doing their own thing. I put the red titles onto the hand-me-down Nook my 15 year old now owns (thanks Grandma! ), and he has a copy of the Study Guide too. We're just starting the second section, on the Saxons, Danes, and Normans (800-1154 AD) and he knows that he can choose which of the four Advanced titles he wishes to read. Okay, who am I kidding? He loves this time period, so he is reading them all. Beowulf from a Literature book, and a biography of Alfred the Great at the same time. I put a mix of the Intermediate (brown) and Beginner (green) titles on the hand-me-down Nook my 13 year old now owns (thanks Grandpa! ), and he knows that he can choose which he wishes to read. The titles grab him... titles like Boy's Book of Battles. He also fully intends to read Days of William the Conqueror. He's severely dyslexic, so I don't expect him to read many for himself. Since Connor was interested in a couple of these also, they negotiated that Connor will borrow William's Nook and read a couple aloud. My Kindle is home to all of the Beginner titles, and some Intermediate ones. Thomas (11) borrows that to read Stories of Beowulf, and I read aloud to all three younger children (Thomas, plus the 8 and 6 year olds) from Our Island Story and Famous Men of the Middle Ages. Everyone is studying the same basic time period. I read the material from the Study Guide aloud. We can discuss all kinds of things, since people are reading/hearing different parts. 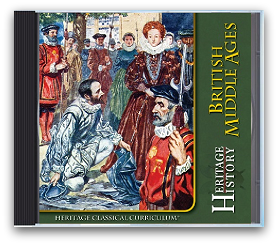 Heritage History's Curriculum CDs can be used as a stand-alone curriculum for the history that they cover (you'd need something else for modern times, for instance). Or they are incredible as a resource for many other history programs out there. They talk about combining curriculums -- using Heritage alongside programs like Ambleside, Old Fashioned Education, or Tapestry of Grace. I'm not completely sure which way we will use Heritage, but we most certainly WILL continue to use it. Like I said, I loved it so much that I spent money. Each Curriculum CD is $24.99, or you can purchase all five for $99.99. Or right now, they are running a Buy 2 - Get the Third Free sale, which is actually 1/3 off on the purchase of three Curriculum OR Library CDs. One of the things I bought was an extra CD-ROM of the British Middle Ages that I've been talking about here. Would you like to win it? Disclaimer: As part of the TOS Homeschool Review Crew, I did receive products as mentioned above for the purposes of a review. The item I am giving away was purchased by me. All opinions are my own. For more about my take on reviews, visit my blog post here. We are enjoying the Ancient Greece CD that I received to review, and I know we would use more of these titles. I actually came to your blog looking for the read aloud link up, but it doesn't look like you are having that now? No, Jennifer... I got a bit busy and stopped doing the Read Aloud linky. I really ought to consider starting up again, or linking to the other one out there. Because I haven't been doing much reading aloud. I'm always interested in adding good living books to our studies...and I'm intrigued by the idea of adding these books to my kindle for my ds10 to read. I'd love to win the CD! We've been loving our living book approach to American history and I'd love to have a good selection of living books for when we move on to world history!! I do understand. I stopped the linkys on my blog. It does take time. Yes, you should start the Read Aloud linky again!! I love Heritage History! You can never have to many books no matter what format they are in. My V is loving Greece. I would like to add more of these to our school days. I'm not entering, because I have that one but they are awesome aren't they? I talked to the publishers IRL at convention Friday night and they were so helpful walking through things with me for notebooking. We were still talking 15 minutes after the vendor hall closed! I just wanted to say Yes! and I already spent more money too. I'll tweet your giveaway anyway! I'm really interested in winning this because I've reviewed the Ancient Greece one and really liked what I saw in it! I loved this product SO MUCH MORE than I thought I would...I want more as well! Heritage History offers so much on their CD's and they've organized & made it so easy to use. We have Young Readers and are loving it, Id like to win this one for my graduating son who is headed to college and loooves to read. He got a kindle for Christmas so it would be perfect for him. :0) Thanks for the chance to win! We're loving our Young Readers CD. I would like to add to our collection! As we consider (and are experimenting with this summer) homeschooling another kid, I would very much LOVE to win this CD. We've loved the Young Reader's set. I'd love to add this set to our school year! WOW! This looks amazing! I am definitely going to check this out! Thanks for reviewing it! I would love to have this! I have been reading great reviews of this product! This looks like just the thing to help us with our world history studies - having kids in elementary, middle, and high school makes it not always easy to keep everyone together! Wow, this looks very intriguing. I'd love to win a CD to use with our history studies. In any case, I'll have to check it out! History was not a subject I enjoyed in school but is more interesting now that I am *ahem* older. Would love something to be appealing for my kiddos. Um because it is awesome! I reviewed the Young Readers CD and feel the same way you do, eventually I will own them all! We just reviewed the Young Readers...and it was SOOOO good!!! We loved the Young Readers collection that I reviewed and would love to have more books in our collection!